Time to get those weekly gaming sessions back in again! Between Namco’s fighting game series, I was more of a fan of the Calibur series than Tekken. While I also enjoy playing the latter, Soul Calibur appealed more to me since it was weapon based combat, the characters were memorable, and it offered a lot of Single Player fun, just right for someone who isn’t exactly into fighting games as a competitive thing. I started with the first game in the series Soul Edge/Soul Blade, then moved on to its spiritual successor Soul Calibur and have been following the succeeding games ever since, with some having big improvements over their predecessors. Yes, I said some, not all. After Soul Calibur II, the hiccups were already showing. Soul Calibur III felt kind of clunky and slow, while Soul Calibur IV took out the mission modes and the Star Wars guest characters didn’t exactly fit in quite well, you could say they were kind of “force-d”. Soul Calibur V… well, it’s half good, since they removed majority of its memorable roster and replaced them with new characters with similar fighting styles (BOO!). On top of that, to have a story mode which just focuses on the game’s central characters was a pretty big letdown for me. There wasn’t even an arcade mode! After V, the series felt forgotten all of a sudden. That is, until 6 years later, when finally the 6th game was announced. And while I was excited that there is finally a new game in the Souls series, I was also worried as the past games haven’t been exactly that good for me. Was VI any different? Let’s find out if the latest installment brings back the Soul Calibur series to its former glory! Soul Calibur VI is actually a reboot of the series, retelling the story of Soul Calibur with quite a number of changes. I personally thought it was about time for a reboot, so I was all ears (and eyes) when this was first announced. It has the usual modes like Arcade, VS both offline and online, and Training. Also returning would be modes like Museum where you can unlock art and cutscenes, which is great because Soul Calibur, in my opinion, has some of the best character designs across the fighting game category. With Arcade mode being absent from the previous game, it was nice to finally have it back and I didn’t realize how much I wanted an arcade mode until I got to play this. Armor break, Critical Edge, and Soul Charge from previous games make a return, where doing a Soul Charge grants you a temporary stat boost and access to new attacks. It also feels like they simplified some things since the Guard Impact now reflect all attacks (High, Mid, Low) no longer requiring you to guess your opponents attack if you need to do a high or low Guard Impact. Tweaks like this make the game more accessible to the new players of the game and the veterans won’t feel shortchanged too much in terms of depth. There is also only one throw command now since the B+G command has been now assigned to one of the game’s new features: The Reversal Edge. When this attack hits, you and your opponent will enter a short cinematic sequence where you will need to enter a single command with the outcome depending on what you pressed. It’s a rock-paper-scissors thing where certain attacks will beat another and when you successfully land a hit, some characters have follow-up reversal edge attacks. It’s actually a fun addition since it doesn’t require a high level of skill but playing mind games with your opponent and beating their attack with yours is very satisfying. Another new addition is the Lethal Hit attacks which vary per character. Basically they’re attacks with certain conditions that, when they connect, will grant you certain advantages. Of course if we’re talking about something new to the game then we can’t forget Soul Calibur VI’s guest character Geralt from the Witcher. Personally, he is a GREAT fit to the series just like how I felt Ezio was also a good fit despite my criticism of the previous game. 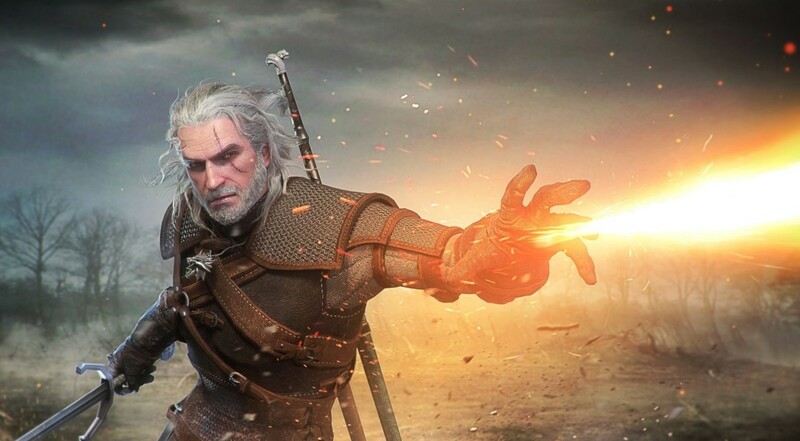 Geralt sword style mixed with sorcery is fairly simple to use and he’s fun to play too! The game simply feels great to play, and no it’s not because it’s been 6 years. Everything feels like the Soul Calibur we’ve known to love – the pace was fast, the mechanics were good and strategic, and it was good to have the usual roster back. When I first booted the game, I started practicing with my favorites like Siegfriend and Mitsurugi and was glad that while there are some tweaks here and there, they still play mostly the same way. In fact, I was able to stand my ground in a few rounds in Arcade Mode even on the hardest difficulty! Soul Calibur 6 felt like a love letter to the fans and I, for one, am glad for its eventual return to greatness. One of the new modes is the aforementioned Libra of Souls mode. Here, instead of following an existing character’s story, you create your own legend by making a new character from scratch and following his story. While Soul Calibur had a similar mode which played like an RPG, in SCVI you can earn money and use it to purchase new weapons and items that you can consume or equip. Your character also earns experience and money from completing the different missions you unlock as you go about your journey, and you can spend the money you earn in shops or exchange the money for Soul Points. Along the way you may also encounter characters from the game and there is also a morality system as your character can lead towards good or evil depending on the choices you make. While it’s pretty fun to level up your character and see what new weapons you can purchase, there are only a few fights in between so if sitting through text and choosing dialogue is not your thing this mode might not appeal much. This mode is very text heavy but for fans of the lore of Soul Calibur, this is definitely right up your alley. Another of the new features is the Soul Chronicle mode, where you play through Soul Calibur main storyline from the different characters’ point of view, heck even Geralt has a story path that tells how he ended up in Soul Calibur’s world. A great touch here is that Bandai Namco didn’t scrimp on the storytelling – the characters are voiced and you can even choose whether to listen to them in Japanese or English. Once you hear Geralt, you’ll be quite amused to know that they got the same voice actor from the Witcher games! It’s these small things that make the fans feel that Soul Calibur VI was done with the fans in mind. One thing I personally liked was how I got to learn more about the characters and how they worked in the world since there are details which are more fleshed out. For example, long time fans would know that Mitsurugi seeks the ultimate weapon which is why he is searching for Nightmare and Soul Edge. What wasn’t revealed in previous games is that he actually meets Edge Master along the way and they actually travelled together at some point. We also get to see some dialogue between Astaroth and Ivy how the latter questions Nightmare’s reign of terror of how it’s a waste just to kill for killing’s sake, which Astaroth completely doesn’t mind. It is in these interactions that really ups the narrative of the game and since they’re voiced, you feel their emotions as well. Soul Chronicle is a must play for fans of the game if only to learn more about the characters of the game and their interactions with each other. There are even familiar characters that appear in Soul Chronicles that aren’t in the main roster, like Hwang, which probably hints at him being a possible DLC character. – Not a lot of fights in Soul Chronicle/Libra of Souls. It is a true “story” mode. After a long hiatus, Soul Calibur is back in good fighting form with this latest installment. There’s enough here that can rekindle your love for the series that was possibly lost during the previous 2-3 games. You could say that with each game after Soul Calibur II, each new release had something good but was missing that certain something and with Soul Calibur VI, Bandai Namco has finally struck a balance that will appeal to fans and newcomers alike. Earning Soul Points can be a bit of a grind and while there are other things I would have wanted as a fan of the series, the fact that it plays like the Soul Calibur of old is more than enough. Hopefully this won’t be the last we’ll see of the Souls series as this deserves a spot beside Tekken as a premiere fighting game series whose legend should never die. Previous articlePlay Everything Roadshow is back at SM North EDSA this weekend with even more awesome games!